Can I get digital TV on my older TV set? Can I hookup digital cable on my old TV set? The answer to these questions is YES. All you need is the proper gear to do so. Should I buy a new digital TV? That depends on your budget. If you can afford it, then yes, try to get a quality TV however. Low cost TVs can be low quality or refurbished models. I like my old TV. Do I have to buy a digital TV? No. You can still get local TV and digital cable TV, all on your old set. You will need some new gear however. If your TV only has a 75 ohm (or 300 ohm) VHF/UHF input jack and no RCA audio/video input jacks (yellow, white, red), chances are it also does not have a cable ready tuner. Many people use a VCR which has a cable ready tuner in order to watch analog cable TV without using a cable box converter. The VCR has to be powered ON all the time you are watching cable TV. The TV has to be set to channel 3 or 4. What if you just want to watch a local over-the-air channel? Turn off that VCR and switch over to your antenna. You can change channels on the TV. 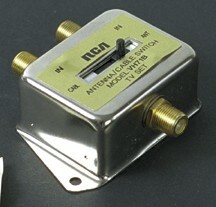 Using the A/B switch, available at electronics stores or online (Amazon.com), you can switch back and forth from cable TV to local antenna. You need two additional lengths of coaxial cable RG-59 or RG-6 available at local retail stores or online. 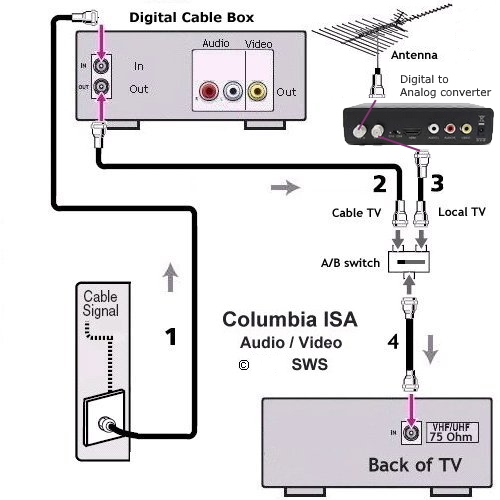 For non-scrambled analog cable channels just take the coax cable from the wall and connect to the input antenna jack on the VCR. Tune the channels on the VCR using the VCR's remote control. Hookup another coax cable from the VCR "Out to TV" OUT jack to the input of an A/B switch. Connect your VHF/UHF antenna to the second input on the A/B switch. Next connect a coax cable from the A/B switch output to the TV 75 ohm input jack (antenna) on the TV set. The A/B switch is set to the "A" or "CBL" position to watch Cable TV and the "B" or "ANT" position to watch over-the-air local TV. Note: Typically your cable TV provider transmits lower frequency analog channels on some of the same frequencies as VHF channels such as channel 4, 5, 9 or 12. If your cable TV provider sends these channels on the exact same frequency as the VHF channel, you may be able to tune in a cable channel on your TV without powering on the VCR. Additionally you may be able to tune in other cable channels if they are sent out on a VHF or UHF channel. For example cable channel 9 may be sent out on VHF channel 9 or cable channel 12 may be sent out on VHF channel 13. Certainly not all cable channels will be available in this fashion. 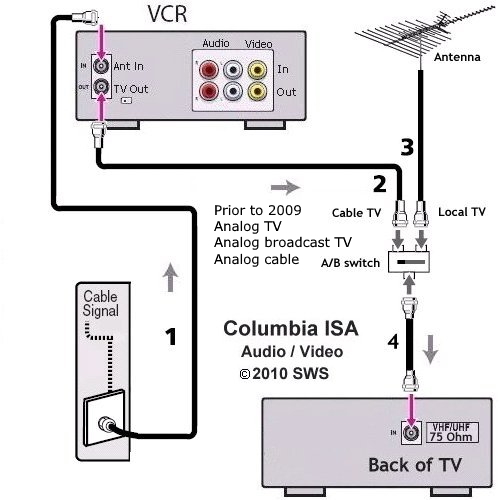 The VCR to TV cable connection allows a "Pass-Thru" when the VCR is not powered on, so any TV frequencies available on cable TV could be tuned in on your TV just as if they were being broadcast over-the-air. The VCR itself acts like a small TV station in that signals are sent to the TV on VHF channel 3 or 4 when powered on. Today, cable TV and broadcast TV are both going digital. For broadcast TV, a digital TV converter box or a new digital TV is needed to get local TV stations. Cable TV is increasingly converting to digital channels. Tune cable channels on the cable box. Tune broadcast TV channels on the DTV converter box. Select on the TV, channel 3 (or 4). If your TV has RCA audio/video inputs you do not need the A/B switchbox. You can switch using the TV's remote and select the proper input on the TV set. For cable TV, select the RCA inputs on the TV and for broadcast TV, select the coax/Air input. 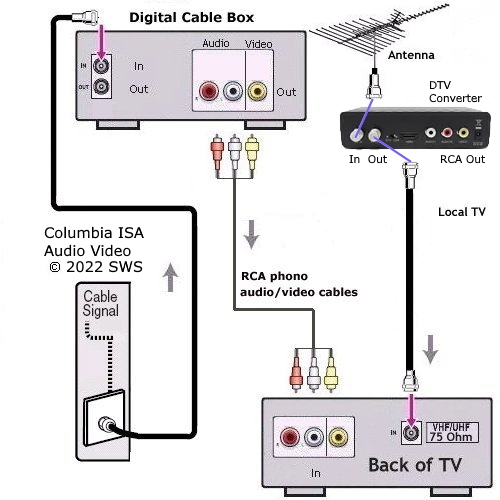 To add a VCR or DVD Recorder, connect the RCA cables and the coaxial cable to the recorder inputs and connect the outputs to the TV. Select channel 3 (or 4) on the VCR to record the DTV converter box's output or select the LINE input (L1) on the VCR to record the cable box's output. Select on the TV using TV remote, RCA inputs or the coax/air input. 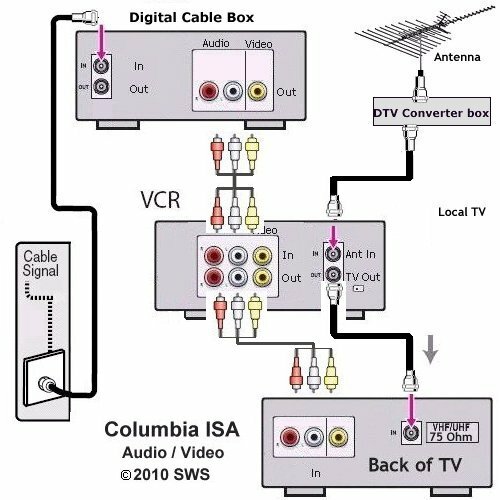 If your digital cable box only has the three RCA outputs and no coaxial output, then you can use a RF Modulator to convert the yellow, white and red cables to a single coax for your older analog TV. Cable TV providers are moving all channels to digital so if you have no cable box at all, you will need a DTA (adapter box). See for more information on this box.